I remember M&B doing a draught (keg) version of the Centenary Ale which we had in the Great Stone in Northfield, Birmingham. Don't know how strong it was, but it certainly tasted a lot stronger than Brew XI! 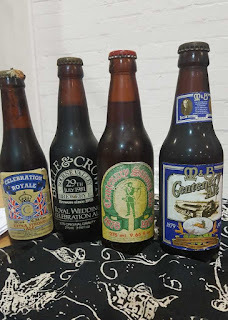 The last one like that I opened was last year - a rip-cap stubby bottle of Sam Smith's Strong Porter brewed in 1981 for Charles and Diana's wedding. A slight hiss on opening and not much carbonation left but packed with vineous flavours. Not a bad gamble. There's a bottle of Bathams Special Strong Ale under the sink that's a good 20 year old now so I might roll the dice with that over the weekend.